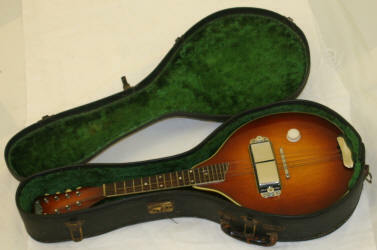 The famous guitar company was quite possibly the first major manufacturer to build an electric mandolin. How do I know? A picture of one (right) appears in their 1932 catalog, back when they were still known as the Electro String Instrument Corporation. By 1936–1938 the design had changed a bit, as we can see from the virtually mint-condition instrument above. By the time it was built, the company had changed its name to Rickenbacher—with an "h."
Between 1957 and 1965, Rickenbacker made eleven solidbody electrics (right). The first was a prototype; the last one was custom-built for the Byrds; and there were nine in between. According to historian Richard R. Smith, there were three models: the 5000 had four strings, the 5001 had five, and the 5002 had eight. I've never seen a 5000 or a 5001. In the late 1990s they were reintroduced and available again for a few years. The model number for the reissue (bottom left) was 5002V58. You'll notice that both the original 5002 and the reissues have a fret marker at the 9th rather than the 10th fret—correct for guitars, bad for mandolins. 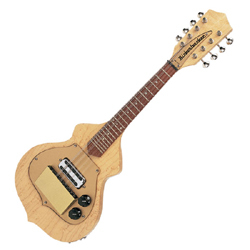 In its 2008 catalog, Rickenbacker finally introduced a mandolin with a 10th-fret marker (bottom center). Finally, at bottom right is a custom Rickenbacker "Mando Guitar" (actually an 8-string tenor), one of three in existence, also with a marker at the 10th fret.